So last week we discussed our returning favorites, so why not turn our eye to the brand-spankin’ new series that are starting up each and every day? What new show are you highly anticipating–and which ones do you think will flop? Personally, I’m jazzed about The Event, but then again, it’s NBC, so I’m a little hesitant. After all, NBC is the one that brought us Heroes (even though, they did have a good first season). Honestly, I just get nervous about anything NBC puts mad publicity and marketing behind, which appears to be the case for The Event. But I do like Jason Ritter. What else? Hmmm. Is it sad that I’m not more excited about new series? I’m sure there are others. Better With You has potential, mainly because of the cast, but I’ve heard some mixed things about the series (laughtrack, anyone?). I guess the only other one I’ll keep my eye out for is No Ordinary Family. Again, I like the cast, but it sounds a little too much like Heroes. I have hope, though. Who knows? It could be more Incredibles than Heroes, and I liked that movie. What about you? This might help; it’s a schedule of premieres, so you can see what’s coming up–and they link out to some descriptions. We’ve done an open thread on disappointments, but let’s go a little beyond that. I was just thinking today how I missed watching my drama-filled episodes of The Best Years and instead I got this crappy season two that deserved to to be cancelled. What shows have let you down? I randomly got a review copy of The Best Years a year or two back, and I must say, I wasn’t expecting much. But somehow I got really hooked and really invested in the show–especially the characters. Every week was a life or death drama, and honestly, when I would tell JC what happened, he wouldn’t believe so much happened in one season. So after eagerly awaiting the start of season two (which I had to watch online because I wasn’t Canadian), how disappointed was I to see that half the cast had gone, we’d jumped ahead months, and it was…boring? I was just so…let down. Sure, I’m sure there were extenuating circumstances. The show did have a long hiatus, and they might not have been able to get all the actors back, but even the writing and plots just sucked. Give me back my drama. And it’s not just random Canadian teen shows that does it. Look at the second season of Heroes! There was no excitement and new characters that I had no interest in. Honestly, It was a relief when the writers strike cut it short. But what about you? Has a show just ever let you down? It can be an old favorite or something you were just getting into. It can even be a minor storyline that you just thought, why is this on my show? By the way, apparently you can still watch some of The Best Years online. Check it out. We’re in May. That means we’ve come to the time where we’re saying good-bye to shows for the summer–sometimes for good. And some of those shows, while they’ll be back next year, just might not need to be. What shows do you think have run their course? Which shows just have nowhere else to go? You know my number one option: Heroes. But that one’s obvious. That show really should have been one season and that’s it, and if they wanted to continue it, start afresh with a new villain, new characters, etc. But what else? Personally, I think The Office has run its course. 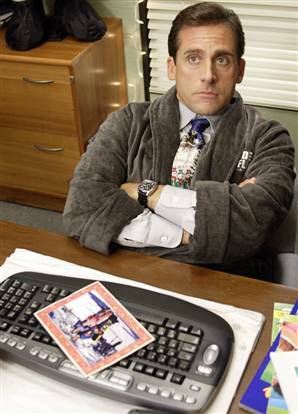 With the new news that Steve Carell might leave in a couple years, everyone’s wondering if the show would keep going without him. Well, how about end it now? We’ve got nowhere to go with Jim and Pam (who are just unfunny now), Michael’s the same as he’s always been, Dwight and Angela are old news, and while Erin and Andy are cute, there’s nowhere for them to go that hasn’t been done before in any of the other office romances. In other words, it’s time to sign off. But that’s just me. What show do you think has run its course? Thanks to my tweep YouSillyGoose for offering up this awesome open thread topic! Here’s an interesting typecasting description: Who do you cast when you need a character who won’t die? Well, David Anders, of course! Between this and Heroes (and a weird low-budget horror flick I watched a few years ago), he’s got quite a career for being a ominous character with no plan on going six feet under any time soon. Didn’t quite work out on Heroes. But he tried. Anyway, I do like the introduction of Uncle John Gilbert, though I have to say, I think we all would have been a little better off if Elena’s father hadn’t given John his ring. After all, he would be, well, alive right now. It appears the only mystery behind John, though, is how he knows his information? I appears that his goal for being back in town is to rid the place of vampires, but how did he know the intricate details of what Damon has been up to? It’s certainly more than just asking the blood bank people if they recognized a photo. After all, he’s the one who directed Elena’s birthmom to Damon in the first place (if what he says is true), so he clearly knows a lot about the Salvatores. I’ll also admit that the “Everybody will die” show is quite entertaining. I was shocked still when Damon broke John’s neck and threw him over the railing, but disappointed to see that he didn’t actually make it very far into the series. Fortunately, he didn’t quite die as we expected so he’s still around. I do have one comment, though: I will get mightily irritated if we find out that many people have these rings, just because in an “Everybody will die” show, I want to see that follow through from time to time. Meanwhile, we had Stefan and his craving for human blood. We got the impression from last episode that it will play a big part of his life now, and it was interesting to see his reaction to passion with Elena as a transition into bloodlust, and I also enjoyed seeing his almost fight with the guy at the party. But seeing him get drunk to try to avoid his lustful intentions? That seemed like a stretch. And then there’s Jeremy. Elena attempted to find out if he knew anything (which of course he hid), but the problem with a show like The Vampire Diaries is that the title calls for a little thing like a diary. Jeremy discovered that Elena knew the entire time–and I’m sure that won’t bode well for her relationship with Jeremy in the future. Now, I will say this: These Gilberts seem to take everything in stride. I mean, Elena’s barely reacting (beyond general worry) to Stefan’s new blood addiction, and Jeremy barely blinked when Elena told him she was adopted. These people should lead the nation in times of crisis, I swear. Anyway, this was an alright stepping stone episode this season, but I will say that I miss Caroline and Matt’s cuteness, and I want Bonnie back. Anything else you’d like to request? I should say that at least we didn’t put Melinda in some superhero costume, like they did in the videogame episode. Clearly, this “effect” was just for effect, but it was, well… Did anyone else feel like they just watched the Sims on television? It was…odd. And the strangest part about it was that it wasn’t original. Each time the ghost took possession of another person’s body, I was expecting their eyes to turn white like they do in Heroes, back in the day of Mr. Isaac (as Hiro called him) and Peter Petrelli. Even the style of art was the same. I mean, I have much respect for graphic novels (after all, I read the continuations of Buffy and Angel), but this was just too close to Heroes. And the plot was just so complicated. I like plots where I can kind-of guess along, and then I’m surprised to discover that I was right or wrong. There was no guessing with this plot. I mean, saying, “He took my life,” was just an attempt to throw you off the scent, and it was a stretch to think that the ghost meant the life in the comic that was a reflection of him. That was solely there to throw off the viewers. And I hate that! I want to feel like I can follow along. Sigh. I did appreciate the step-brother, though, and I think that he was a great person to cast. I do feel bad that Melinda really told him very little about what the ghost was telling him, but I suppose they’ll just catch up off-camera. Meanwhile, Eli needs to go. Does Jamie Kennedy understand how to act at all? Everything he says is so bumbling and confused. I mean, he has no reaction to anything, except a poorly stated joke, and it’s just annoying. We need Jay Mohr back. Overall, the episode didn’t really thrill me, but it seems on par for the season. Something needs to change, and I certainly hope it’s not the addition of a brother, as Aiden seemed to foreshadow in the end. I actually think we would have had a significantly better season if we hadn’t jumped, and we were just witnessing Melinda juggle whispering with new motherhood and Jim’s med school schedule. That would have been much more entertaining. KT is of peace. Always. Given that (a) I’m a dork and (b) alien invasions are a classic Hollywood storyline, have you ever wondered what a real first contact would be like? Do they crash-land and need our help? Do we exchange radio messages and set up a safe meeting place out by Pluto? Are we the ones scaring the daylights out of them when we show up in orbit? Or does it happen like this, where New Yorkers stand in the streets and stare, but this time not at something lost, but something gained, for better or worse? V‘s creative team have mentioned in interviews that they had set out to recreate the show for a post-9/11 world, and as the best sci-fi can, they’re clearly trying to tackle the fears and concerns of this decade. The 9/11-ish arrival of the visitors — an event after which the world doesn’t look the same any more — and the concern over terrorist sleeper cells are blended with a charismatic new leader and suggestions of universal health care. However V fares as a story, it is unmistakably a product of its times. I’m still working out how I feel about most of the characters. Most seem okay, but a little flat to begin with. Seventeen-year-old Tyler is the only one who actively annoyed me — and since it looks like he and his mom will be an important part of the plot, I hope that changes. I did like FBI mom Erica’s relationship with her partner, but when Alan Tudyk was credited as a guest star I already knew it couldn’t last. At first I figured he would just get killed off, but when they kept putting emphasis on “Wow, it’s like the terrorist cell was tipped off!” I knew he had to be the mole. What is it with Alan and roles where he’s not who he appears to be this year? What I didn’t foresee was Ryan (who bought the engagement ring) turning out to be involved with V resistance, and I certainly didn’t expect him to be a V himself! I figured he had a dark criminal past he had run away from, but this twist was much better! He’s one of the few characters I’m really interested in after this episode. I’m also interested in how reporter Chad will deal with his conscience, his career, and his V contacts. And maybe it’s just because Firefly‘s Morena Baccarin is playing the part, but I think Anna is a fascinating enigma as well. I’m also enthralled by her shiny, shiny spaceship. Ships, in the plural, actually. I hope they remember all those other ships and all those people around the world who may be reacting differently than our New Yorkers. While I don’t want a Heroes-sized cast, let’s do remember that New York isn’t the capital of the planet. A look at the reaction in Paris or Moscow or Tokyo could be an interesting wrinkle. I am glad that they put the reveal about the V’s true appearance and intentions up front in the first episode. I’ve never seen any of the ’80s series, but it’s hard to find a description of the show — the new or the old one — that doesn’t read “Aliens come to Earth offering friendship and new technology, but turn out to be sinister reptile creatures!” So, glad that cat wasn’t meant to stay in the bag for long. In the next three weeks, and then when the series comes back in March, it looks like we’ll be watching Erica, Father Jack, Ryan, and Georgie begin to build the resistance despite inevitable conflicts in their personal lives, while Tyler and Chad help us get a closer look at the V’s themselves. And what exactly is it the V’s need from Earth? Are we the entree, as in the Twilight Zone‘s “To Serve Man”? Or is something more complex going on? Please note this might include possible spoilers for shows that you haven’t seen before–both past and present shows. The most recent episode of The Vampire Diaries has really caused a lot of chat around the web about the freshman series. And honestly, who can blame them. To kill of a character that was in the prime of a storyline takes guts. And apparently executive producer Kevin Williamson has them. No one’s safe on this show. We’ve reached the point when we’re watching TV that there’s no jeopardy, no risk, no stakes, when we know our lead characters aren’t going to be killed. Well, that’s not true on this show. I’m starting with the supporting characters and I’m working my way in. Everyone’s going to die on this show. This is a show where characters you love may die, and it’ll be unexpected and shocking, so get ready for it. It’s as simple as that. And [Vicki] was the first casualty. I love it. What balls! And honestly, I feel like that’s the failure of so many shows: the fact that they’re afraid to do anything to lead characters. It’s not that I’m a fan of aimless death of characters. Without a purpose, there’s no reason to do it. Or, on the other hand, if it’s just a publicity stunt, that’s a waste of a viewer’s time (and usually, not as big as you’d think). From someone who’s a fan of Joss Whedon’s work, there’s clearly a bias on my end toward character death. He knew how to do it, when to do it, and how to do it with the most emotion involved possible. Taking the death of Tara McClay alone–it was a heartbreaking moment that really turned the character of Willow. Right as we were growing more and more attached to Tara overall. And then there was Doyle from Angel, another risky move by a freshman series. But without his death, who’s to say that Cordelia’s story would have progressed in the way it did. No visions? Plus, Whedon took the extra risk: to kill off a new character–one who’s name was recognizable from Roseanne fame–only a few episodes in. Sound familiar, Vampire Diaries? I feel like that’s even more of the struggle. It’s one thing to kill someone off, but what if they’re someone that people love? Well, that just makes that much more of an impact. No, I mean the actor? What if people love the actor? Welcome to Heroes. Heroes made a great move by creating an ensemble cast filled with new names and famous ones. The problem is, they won’t get rid of any of them. Sure, there’s a death this year, and there have been before. But no one ever leaves. Now the show is more unruly than ever before! The problem is, some people think a show is quality because of its actors. In some sense, it is. But there are also directors, writers, producers–and entire treasure trove of people that come together to watch a show. Sure, actors might bring a viewer in, but substance keeps them watching. I didn’t stop watching Joan of Arcadia because they killed off Judith. I didn’t stop watching Tru Calling because they killed off Luc. I kept watching because I knew something must be coming that made that death worth it. And House? Having a doctor commit suicide when you didn’t even know something was wrong gave the show the turning point it needed to get House as a character out of his rut and developing as a person all over again. So yes, I’m a fan of character deaths, and I adore that Vampire Diaries has jumped in with both feet, knowing that they’ll risk it all. They’ll risk characters lives. It’s a dark show. They should! And Williamson has a point: If you can’t be scared for the people you care about, how can you be invested in a show like this? Something has to be at stake.